A Marilyn is a mountain or hill in the British Isles with a relative height of at least 150 metres, regardless of absolute height or other merit. The first one I climbed is also the highest one, Beinn Bheigier. 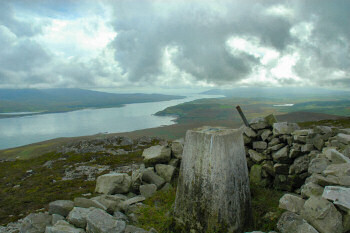 During the Islay Walking Week in April 2005 Calum Sharp took us to the summit of Beinn Bheigier. While the weather was a bit hazy I still managed to create a QuickTime VR panorama of the view north and east from Beinn Bheigier. The next one was in the same year, when I visited the north-east of Islay to climb Sgarbh Breac in August 2005. Despite quite a bit of clouds the view over the Sound of Islay and Bunnahabhain Bay was impressive, as you can see in the QuickTime VR panorama of the view from Sgarbh Breac. The last and most recent one was Beinn Mhór on The Oa. We visited it during the last day of the Islay Walking Week in April 2006. This was an amazing day with beautiful sunshine, so I had to split it into two pages: The Oa and Beinn Mhór and The Oa and Beinn Mhór (cont'd). No panorama of the view from the summit though, the closest is a QuickTime VR panorama of the Monument on The Oa. I hope this gives a good overview of the marilyns on Islay. There are even more impressive ones on Islay's closest neighbour Jura with the Paps of Jura, but I'll leave that for another entry.